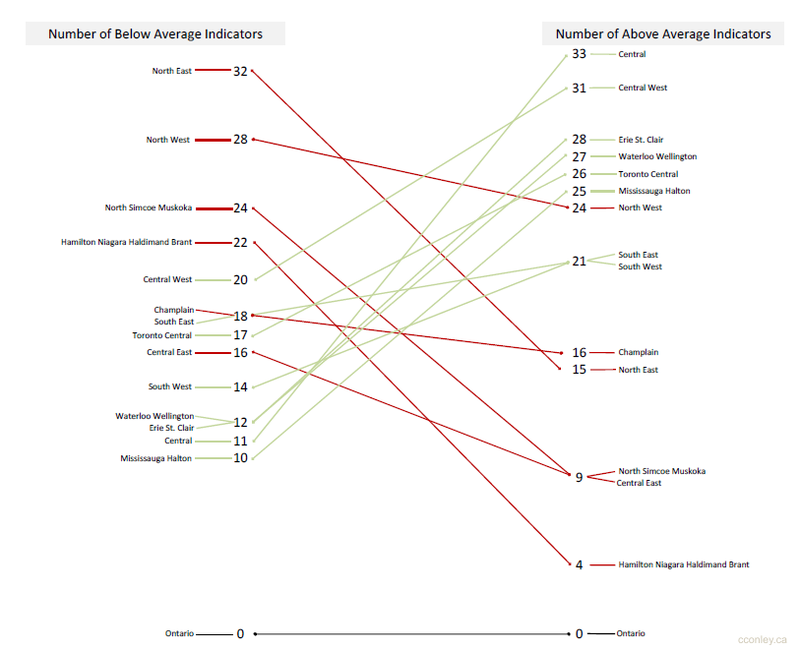 Last summer I shared an adaptation of Tufte’s slopegraph using data from the Institute for Clinical Evaluative Sciences‘ (ICES) 2011 Quality Monitor report in the post Education and Health Care – Using Slopegraphs to Understand Complex Systems. While this initial visualization involved post-processing (with the hope of exploring code to generate something similar), Bob Rudis (@hrbrmstr) has developed a Python solution to generating slopegraphs and has used the 2011 Health Care slopegraph to serve as an example. In his post Slopegraphs in Python – Slope Colors Bob has replicated both the slopes and the color coding, which I had used to visually reinforce the direction of the slopes. Thanks to Bob for his willingness to share his code and for using my adaptation as one of his examples! This entry was posted in Data Visualization and tagged Data Visualization, Health, Ontario, Python, Slopegraph. Bookmark the permalink.